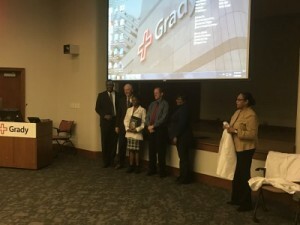 Eight students at Cedar Grove High School received their first white lab coats on Dec. 8 as part of the Reach One Each One High School Youth Medical Mentoring Program at Grady Memorial Hospital in conjunction with the Morehouse School of Medicine and the Emory School of Medicine. In total, 34 Atlanta-area students graduated from the program this fall. 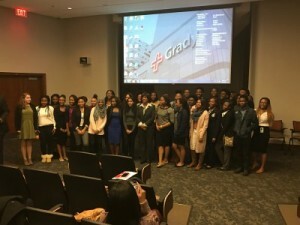 DeKalb County School District participants include: Derek Brown, Anarah Huger, Sha’Quandra Hutchinson, Kamryn McClendon, Chelsea Porter, Jasmine Powell, Jada Quintons, Jada Rogers. As part of completing this STEM-based program, students received a white lab coat, a certificate and a book. Mentoring also continues following the program. 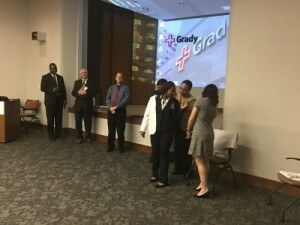 Pictured below, Cedar Grove High School students receiving their white coats for completing the program.